The holidays are approaching. Are they filled with fun or stress for you? Maybe a bit of both? As I remember intimately from last Thanksgiving, it can be pretty rough when you need to be mindful of a specific diet or food sensitivities during the holidays. Last year, I had to make up a ton of food ahead of time and carry it across 2 state lines to be able to eat dinner with the family. Luckily, Thanksgiving tends to be a real food oriented holiday to a greater extent than other holidays. Sure, a lot of the sides are no good, but the main dishes are often friendly towards those with allergies. One must always be cautious, but especially if you are making the meal yourself, it is fairly easy to cook a Thanksgiving dinner that is healthy and delicious. And if you need a GAPS Thanksgiving? That is still the case. Even those on GAPS Intro can enjoy a hearty meal 2 weeks from now. What makes a good Thanksgiving dinner? Is it a specific dish? The food in general? Or the company and the thankfulness around the table? Even those who are on GAPS Intro can enjoy a delicious Thanksgiving meal. It will even transport you straight back to your favorite turkey and mashed potatoes from your childhood. If you are on the early stages of Intro, you can keep it simple and avoid the soup with this Stage 1 “meat and potatoes” tutorial. Boil up some turkey, cook up some “faux-tatoes,” and add your favorite vegetables to the side (I like peas or green beans). 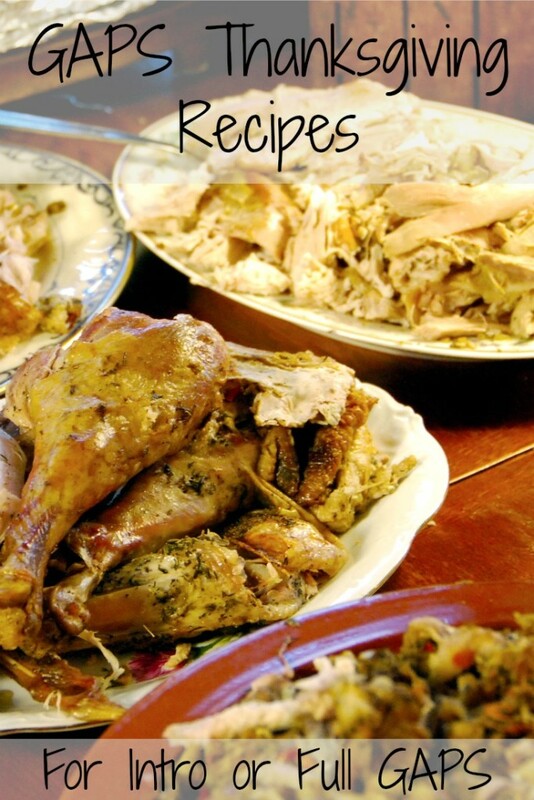 I made this last summer when craving GAPS Thanksgiving food, and it was like the real deal! Or are you content with a simple soup that you can take with you? Whether for the meal itself, or for leftovers the next day, this “Thanksgiving Soup” is a delicious option! If you are later on in Intro or on Full GAPS, a traditional roasted turkey, just like mom made, will do the job! Substitute your favorite fat for butter and broth for the white wine. Top with a starch-free gravy. Delicious options from Elana’s Pantry and Real Food Forager. My meat and potatoes post has many suggestions for starch-free potato substitutions. My favorites are cauliflower or celeriac with lots of garlic! And the best part is that since these dishes are traditionally boiled, they are safe from Stage 1. Boil in broth (meat stock or bone broth) for extra flavor and nutrients. Vegetables – Simple boiling of peas, green beans, carrots, or whatever you like is delicious and simple. Simmer uncovered in broth to thicken the broth into a sauce. Top with caramelized onions (Stage 3 and later). Stuffing is difficult to make for GAPS Intro, but there are many options for Full GAPS using grain-free biscuits. This is a simple recipe, and the biscuits can be replaced with another recipe if you prefer. Two desserts must always be present at my family’s Thanksgiving dinners: Pumpkin Pie and Apple Pie. As fruit and sweets, as well as crusts made from flours, are only for Stage 6 and Full GAPS, you must either go without dessert or improvise if you are still on GAPS Intro. Freshly cooked pumpkin, or other squash, are safe from Stage 1. Make a crust from freshly ground crispy nuts (Stage 3). After Stage 5, spices like cinnamon and nutmeg are allowed. Will you be having a GAPS Thanksgiving? What are your favorite dishes? Shared on Simply Natural Saturdays. Thanksgiving really is a GAPS-friendly holiday! Thanks, Chloe. Great perspective. Definitely! Stuffing and pie are really the main issues. These are such great tips for those with food restrictions! Thank you. 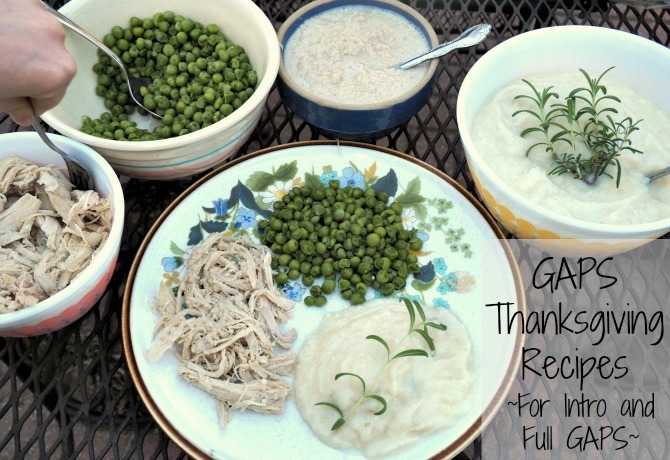 This is great, I really need to get onto GAPS more for myself and our family and it’s encouraging to see how easy and delicious you make it look! That’s wonderful to hear! GAPS has been great for me, and I want to make it appear approachable to others. This is such a great collection of recipes. Thank you for sharing and showing that it is doable and can still be delicious! I know how you feel! I don’t have very many food allergies but my family REALLY thinks that canola oil (among other things) is a health food….makes me cringe! Yuck. My dad still uses Country Crock. But luckily I mostly eat with my mom, who is all about olive oil and butter.